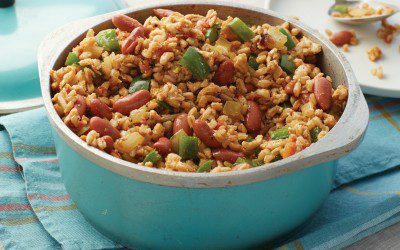 This simple Cajun Grain recipe from Jackie Newgent’s The All-Natural Diabetes Cookbook, 2nd Edition, will kick the monotony out of any boring lunchtime. Packed with the whole grain farro, lean ground turkey, and plenty of vegetables, this is something you can make in advance and then reheat in the microwave for a high-flavor and nutritious lunch entree! Meanwhile, heat the oil in a large nonstick skillet over medium-high heat. Add the turkey, bell pepper, onion, and cajun seasoning and sauté until the turkey is crumbled and well-done and onion is softened, about 5 minutes. Stir the turkey mixture and beans into the farro mixture, cover, and continue to simmer until the farro is tender, about 20 minutes. Remove from heat and let stand, covered, for 5 minutes to complete the cooking process. Then serve. Exchanges per serving: 2 starch, 1 vegetable, 1 lean protein. ©2015 by Jacqueline A. Newgent, RDN. From The All-Natural Diabetes Cookbook, 2nd Edition. Reprinted with permission from The American Diabetes Association. To order this book, call 1-800-232-6733 or order online at Shopdiabetes.org.